A question that keeps getting asked in my field: Is there an Asian Australian culture? A recent article about young Asian Australians forging an identity of their own caused a fair amount of commentary on my social media streams. This is for varied reasons, first and foremost being that many people I follow are very interested in Asian Australian identity and would definitely have an opinion on it! The comparisons and implied derivation from Asian American culture did not help, given the US's track-record of cultural imperialism in Australia. The article was also — necessarily perhaps — focused on a fairly narrow demographic of a particular generation. So, the short answer to my opening question would always be 'no'. 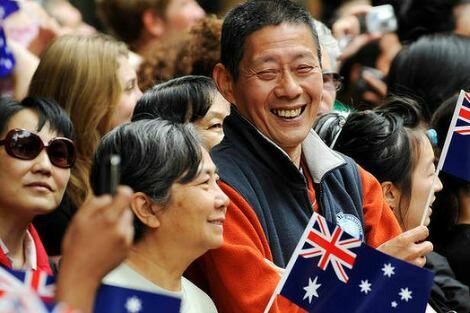 There is no singular Asian Australian culture, just as there is no single 'Australian culture', no matter what some politicians and certain organisations may want to opine. Rather than argue endlessly about what constitutes a particular cultural or heritage group's culture, it is often more useful to look at why we're trying to articulate one in the first place. As well as an unfortunate tendency to flatten differences, trying to talk about particular groups can serve a broader political and cultural project. There can be good reasons to do so. I run a research network focused on Asian Australian Studies. The topics we cover strive to give depth and detail to otherwise stereotyped, shallow representations of Asians and Asian Australians that surround us. It isn't just reactive, either, with a lot of work generating important insight into the creative and political aspects of living as a racial minority in Australia. The connections in many of these projects, stories, families and communities resonate near (such as our neighbourhoods and cities) and far (like the idea of being part of an 'Asia Pacific region', or a Chinese Malaysian diaspora). Many scholars and artists in the research network create and develop knowledge around experiences that aren't very often documented or have been typically dismissed, as well as forging completely new ways to understand our world. Asian Australians who aren't first generation migrants often grow up not seeing themselves in the stories and shows of their childhood. They become adept cultural transposers. As a child, I watched a lot of ABC television, like The Goodies, Dr Who (my childhood Doctor will always be Tom Baker), and the Kenny Everett Show. I was a dedicated watcher of Neighbours for about a decade, from the very first episodes. Our family also soaked up the Monkey series and cartoons like G-Force like nothing else, as well as avidly watching bootlegged Jackie Chan and Bruce Lee movies. "The '1.5 generation' Asian Australian that I am (someone who migrated before their teens) is continually delighted to read and hear voices that populate the Australia with which I am familiar." Even today, with so much on offer from digital media in many languages, from many sources, I hunger for representations from my surrounding communities and their particular experiences. I think it's important to hear our own voices sharing stories and experiences with our accents, nuances, and slang. I love hearing 'Manglish' (Malaysian English patois) conversations with broad Australian accents on the trains. I'm excited that TV shows like Maximum Choppage and The Family Law were funded and have screened. I relish each new publication by Asian Australian writers, and I feel lucky that there's so much going on with the literary scene in recent years. And all of this is just my small corner of accessing and interpreting 'Asian Australian culture', which is strongly influenced by growing up in Australia as a Chinese Malaysian who is monolingual (Okay, I lie — I do speak yumcha Cantonese). The researcher in me places these encounters and texts within the scholarly literature of the field of diasporic Asian studies and Asian Australian studies. The '1.5 generation' Asian Australian that I am (someone who migrated before their teens) is continually delighted to read and hear voices that populate the Australia with which I am familiar. Tseen, I have taught Chinese students domiciled in Australia for many years, many born here, as well as many from Chinese communities in Hong Kong Malaysia and mainland China in recent years. I reckon there is definitely an Asian Australian culture. I can certainly tell the difference between it and the Hong Kong Chinese, Malaysian Chinese and Mainland Chinese. I reckon we shouldn't define it, however, we should all be simply Australian without artificial identifications. I have as much Irish in me as you have Asian but like you, I'm not an Irish Australian - just an ordinary old Australian. Sometimes, however, I do become irrationally teary when the Irish rears its genetic head. You make your own culture, choosing what to inherit or procure. It's no problem to take a detour from Standard Australian English into Manglish or Singlish in the church foyer before or after Latin Mass. We being the people who populate Australia. What do we have in common? Mobile phones, keys, wallets, phone chargers. And those who do not possess a mobile phone, phone charger, keys or wallet. We catch taxis, we fill out forms and many of us like pizza and laksa. Or not. So much in common. Mate, Even a fifth generation Anglo-Celtic Australian can pick up a bit of yumcha Cantonese (providing it's transliterated). But can you speak other dialects of Menu. I am an Australian born Korean. I am 100% Australian when with (white?) Australians. I am 100% Korean when with Koreans. I am 100% Korean Australian when with Australian Koreans. I am who I need to be or remain who I must be given the circumstances. That is my advantage. FYI there used to be an Australian culture but it has largely gone due to migration. The well educated Australians that used to perpetuate the culture are too polite to talk about it because even if they did the typical migrant would not understand nor would they accept the concepts of it. We hear echos of the culture past in today's random racist rants. It is ironic that the understanding, accepting and patient Australian culture of old was the root of its own demise. Australians were a noble people. They were a Christian people - well at least in Melbourne they were. Migrants have phased all of that out very well taking advantage of the 'fair enough' guilt Australia was subjected to. I lived through the cultural change and witnessed the demise of Australian culture. Australia is truly the lucky country but no one knows it. Great to see work is being down in this area as an alumni.